Facts: Officer gave client a citation for reckless driving. Client had several prior traffic tickets on his record. Result: Case REDUCED to Improper Lane Change upon Motion filed by Kreps Law Firm Traffic Attorney, and client paying court cost. Facts: Client was issued a warrant for failure to appear for outstanding traffic violations from April 8, 2008. Result: All warrants were recalled. Client plead guilty to a REDUCED charge of speeding and no child restraint. Charges of no tag and no insurance were DISMISSED upon Motion filed by Kreps Law Firm Traffic Attorney and client paying court cost. Facts: Client was ticketed going 86 mph in a 70 mph zone. Result: Charge DISMISSED upon completion of driving school and payment of court costs of $159.00 per negotiations by Kreps Law Firm Traffic Defense Attorney and prosecutor. 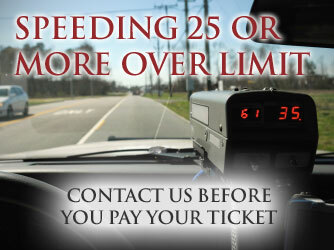 Facts: Client was ticketed for speeding 87 mph in a 70 mph zone. Result: Speeding ticket DISMISSED upon completion of defensive driving school and payment of court costs of $138.00 per negotiations by Kreps Law Firm Traffic Defense Attorney and prosecutor. Facts: Client was speeding to get home during a tornado warning and was ticketed for reckless driving. Result: Charge DISMISSEDupon completion of Deferred Prosecution Program (6 month period of time free from any major criminal charges) and payment of fine and court costs of $263.00 as negotiated by Kreps Law Firm Traffic Defense Attorney. Result: Per negotiations between Kreps Law Firm Traffic Defense Attorneys and prosecutor: no insurance and speeding 25 mph over cases DISMISSED with no court costs. No driver’s license case DISMISSED upon payment of court costs of $138.00. Guilty plea entered to improper tag upon payment of fine and court costs of $238.00.